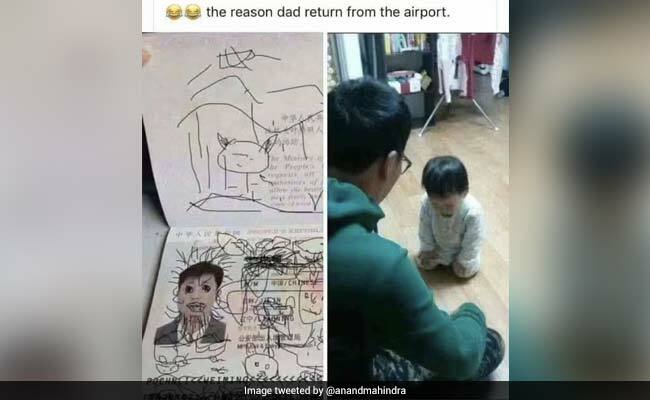 Anand Mahindra shared a picture of the passport which shows drawings in black ink, along with another pic featuring an apologetic toddler being scolded by his father. A picture shared by Anand Mahindra on Twitter. Business tycoon Anand Mahindra reached into his WhatsApp wonder box to pull out another gem and share it with the world. This time, it's the story of a young child from China who decided to unleash his creativity on his father's passport by drawing all over it. The story first went viral in 2014, and is now widely believed to be a hoax. However, it still makes for a good reminder to keep your travel documents away from kids. In his tweet, Mr Mahindra shared a picture of the passport which shows drawings in black ink, along with another pic featuring an apologetic toddler being scolded by his father. For Mr Mahindra, the post served as a warning to keep his passport away from his grandson. "Since I have my rather unruly toddler grandson staying with us at the moment, I shall make sure my passport stays out of reach of his hands," he wrote while sharing the post. Here is how people reacted to the tweet. Passports are coated with a thick plastic sheet. Relax sir. 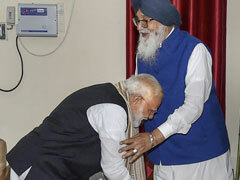 Even this pic is fake. This isn't the first time Mr Mahindra has shared hilarious posts he has received on WhatsApp. In the past, his wonder box has thrown up a dish called 'delicious roasted husband' and a delightful clip of US cops doing the garba.